A CCD or Charge-Coupled Device is an analog electronic device that can be used as the image sensor in place of film in an electronic camera or optical devices like microscopes or telescopes. CCDs are also used in digital and film cameras as parts of some autofocus and light metering systems. A CCD is a rectangular semiconductor chip with a surface built of an array of light-sensitive areas (pixels). Each pixel is a kind of combination of photo diode for light-sensitivity and capacitor for analogue value storage. Many digital cameras use CCDs as their image sensor, although some use CMOS or other devices instead. The CCD was invented in 1969 at Bell Labs by Willard Boyle and George Smith. Since that CCD was sensitive to light it was used as image sensor for video and TV cameras. It could also be used as a memory device or analogue signal delay since it's principally a kind of analogue shift-register circuit. Thus the image information given in parallel to the whole pixel matrix during exposure is read sequentially by the camera's image processor after exposure. 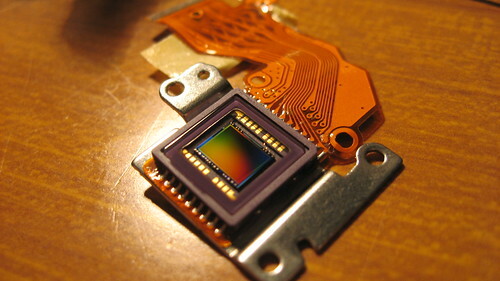 In 1972 semiconductor maker Fairchild introduced the first experimental CCD for photography which made exposures of the format 100×100 pixels. Production was launched in 1974. In 1986 Kodak introduced the first 1 Megapixel CCD. As a plain CCD will only produce a greyscale image, further developments were needed for them to see in colour. Some early cameras (e.g. Minolta RD-175) used more than one CCD - with a colour-separation prism or filter directing different colours of light to the individual sensors, analogous to some early colour film photography techniques. The dominating colour separation concept of digital photography's first two decades was developed in 1975 by Kodak's Dr. Bryce Bayer who had the idea of putting a color filter onto each light-sensitive area of the chip. A repeated four pixel pattern with two green-, one blue- and one red-filtered area was the successful design for better colour CCDs. Nowadays even Kodak begins to use alternate filter patterns, but the so-called Bayer filter or Bayer RGGB pattern is still in use by the image sensor makers. Colour filtering does come at the expense of some resolution relative to a plain black and white CCD. Some anomalous CCD designs exist. Fujifilm's SuperCCD design uses a honeycomb technique to increase light sensitivity. Foveon's X3 CCDs produce colour through an alternative process which layers RGB sensitive photosites on top of each other instead of in horizontal rows. This produces output with lower total pixel counts but far higher per-pixel resolution than can be produced from a standard colour filter CCD. Overall colour quality is higher than standard CCDs but noise has been a persistent issue. The resolution of the image sensor governs the resolution of the camera, although some cameras can produce increased pixel counts using interpolation software - particularly with multi-CCD sensors. The sensitivity to light of the sensor controls the ISO range that the camera can emulate. More sensitive sensors can also permit greater pixel bit widths, and so give better colour rendition. Larger sensors perform better at lower light levels - larger pixels can gather more photons at any given light level - so allowing lower-light photography and generally reducing noise. Just like larger film formats, larger sensors require longer focal-length - and hence larger - lenses, thus dictating the size (and weight) of the camera. Larger lenses may also increase the cost of the camera. By contrast, smaller sensors and hence shorter lenses can have their own problems; very short length lenses can restrict the use of very small apertures - e.g. a 5mm lens stopped to f16 would have an aperture of only 0.3125mm; such small apertures can be hard to control accurately and can be subject to diffraction problems. Larger sensors are likely to use more power - increasing battery requirements. Many of the big camera makers or consumer electronics companies have their own CCD production facility, for example Sony and Fujifilm. While also making its own cameras, Kodak is also a leading company in sensor technology, providing high resolution CCDs for the likes of Leica. Other companies specialise in making camera sensors, among them Omnivision and Dalsa. Dalsa already offers a low-noise still camera CCD with 33 megapixels, still based on the above-mentioned Bayer pattern. Through-the-lens measuring techniques, especially distance measuring of autofocus systems rely on CCD components, even in analog SLRs. Light metering can also be based on a CCD as sensor.